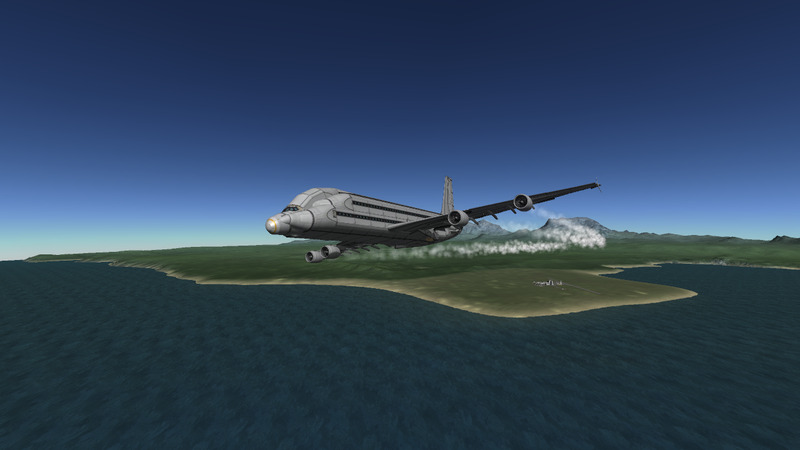 Note: This is almost identical to my original A-380. The only changes are the use of 8 regular power engines instead of 4 230% power engines, since the challenge I’m entering this into says stock and I wasn’t sure if modified craft file really fit that discription. I also made a slight modification to the landing gear shrouds. DISCLAIMER: Trolltech Extremal Design Co. cannot be held responsible for any bodily harm, death, or property damage caused by user error or misuse. Accident reports however may be filed, and if deemed appropriate, will be investigated. A stock aircraft called Airbus A-380 [For Airshow Challenge Thing]. Built with 446 of the finest parts, its root part is mk3Cockpit.Shuttle.